(ed. note: This is a companion post from www.randallprice.com). For the first tool review on www.randallprice.com I’ve chosen a one that is by far the of the most often used tools in my shop and one that has raised the accuracy and precision of my work to a new level – Veritas® Set-Up Blocks. As you may have already found, transferring measurements is a much more accurate method of set up than taking a measurement from a rule. This is where the Veritas set-up blocks shine. With the set-up blocks you always have a standard reference for transferring measurements within a project, or from project to project. 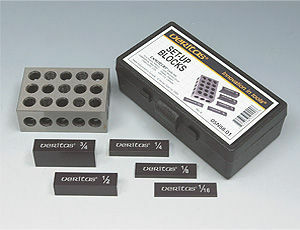 The combination of blocks in this set allows for measurements of 1/16” to 4 11/16”, in 1/16” increments. Another way I use the Veritas Set-Up Blocks guarantees accurate thicknesses from the planer and especially from the thickness sander. This is done by first getting close to the final thickness and then slowly working up to the final thickness, checking against the set-up blocks after each pass through the planer or thickness sander. With each pass place the set-up block next to the stock and feel if they are level with each other. The fingers can detect the unevenness much better than the eye can. Once the stock and block tops feel perfectly level, I know I’ve reached the thickness I want. I highly recommend the Veritas Set-Up blocks, in my shop they are a must-have for every project. Thanks for the review Randy. Nice review Randy…I have a set and would not be without them…much greater precision on set-ups and adjustments. -- "Happiness is creating dust"
Chipy – the set-up blocks are $37.50 – here’s the link: Veritas® Set-Up Blocks. The set-up blocks are something I would not have thought I would use much, but they turned out to be an essential tool for me. You can see from the comments above others have had a similar experience. They seem kind of pricey, but after using them I think they were well worth the price. If you decide to get them I would be interested in how they work for you. which holds an every changing pile of frequently used items, such as a flashlight, pencils, Incra rules, box knife, compass, razor scraper, small squares, digital instruments (3), center punches etc. However, on my TS, I depend on a Wixey digital readout, and a zeroing method that is simple and accurate…...I place a specially made block of oak in a miter slot, and when I move the fence to it, it should read the number written on the block, which I predetermined by cutting a piece of wood at that position, and measuring it with a calipers. I also have the decimal size of the blade (thin kerf) written on the block, and instructions on how to adjust the Wixey if it has gone bonkers (which it seems to do if I forget to turn it off and it automatically turns off). On my RAS I have a special fence for setting crosscuts, which also minimizes the number of measurements I have to transfer. Thanks for reviewing this, I also checked out the video, just to remind me of different ways they can be used. I have a set of these and I also find them very useful….I use them on the router table, TS and for setting up box/finger joints. These are awesome….and the price is very reasonable.